Marie sits with a group of other women outside a small vendor in Saint Marc, Voilá mobile phone in hand. They are waiting to spend the 1600 gourdes (US$40) that Mercy Corps just sent to their T-Cash accounts. As heads of households with IDPs (internally displaced persons) from the earthquake, they are among 5,000 recipients in Saint Marc who will receive money on their phones to buy rice, oil, beans, and cornflour from fifty small, local merchants. Our host for the day, Andrew Lucas, explains to us that this is a much more dignified way of distributing aid than MINUSTAH-guarded blind giveaways, and we wholeheartedly agree. Mercy Corps in Saint Marc are doing their best to make sure that their donations go to people who are most in need, and that their program is conducted with as much benefit to small businesses as possible. Food aid recipients such as Marie seem to be using their mobile money without too much trouble. Mercy Corps help recipients register for T-Cash, give them a mobile phone, help the recipient activate their phone, train them to make payments using their mobile accounts, give them printed instructions, and visit vendors to make sure everything is running smoothly. Mercy Corps also employ volunteers to assist vendors and aid recipients during the transactions. Vendors are also happy: they are moving a lot more stock and making more money. Technical problems that crop up are worth the extra profit. Mercy Corps monitor prices in the town and encourage customers to seek out the lowest prices, as they normally would. What's interesting to us is the overall mobile money landscape in Saint Marc. Thus far, Digicel's TchoTcho Mobile has no presence in the town, and Mercy Corps / Voilá have big plans for the next few months that will integrate an interesting range of players into their program. In April and May, Mercy Corps and the Red Cross will run a market once per week in which 2,500 of the current recipients will be given a one-off payment of US$250 to spend on materials to build or renovate their homes, or to pay school fees (including technical/trade school). Later on, half of these recipients will be selected for a third time to spend a further US$250 on tools for small enterprises. This approach–of targeting customers, merchants, agents, and billers simultaneously–is a promising solution to mobile banking's 'chicken-and-egg' problem of providing enough users for agents, and enough agents for users. It the potential to achieve a critical mass of users that will secure mobile money's future in Saint Marc, so long as the transition from food aid to a publicly available service is handled correctly. At the moment, there is no fully-functioning T-Cash outlet in Saint Marc. Indeed, having functioning agents goes against Mercy Corps's mission, because it would allow beneficiaries to cash out the money they have been given rather than spend it on food. 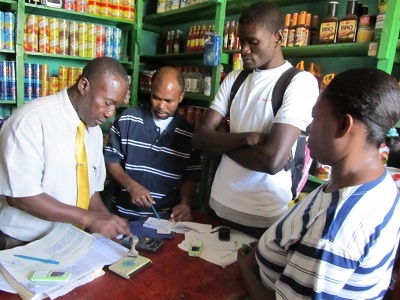 But future users of mobile banking in Saint Marc will need to be given the entire service if their town is to link up with users across the country–and these connections are essential to the future success of mobile banking in Haiti. Who will become T-Cash agents? At the moment, many of the businesses accepting food aid payments are displaying T-Cash signs and banners but are not actually agents. This is problematic because there is a risk of losing customers' confidence, should they try to use a service and find that it is not working. 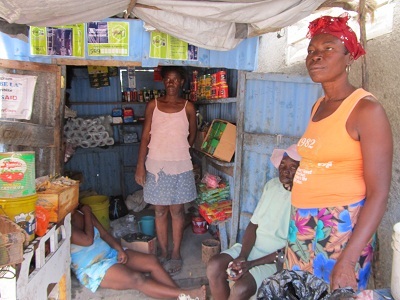 At the moment these merchants can accept payments for food aid and nothing else; their customers cannot cash in or cash out, nor can their other customers who are not aid recipients pay for food. Furthermore, most of these vendors are not eligible to become T-Cash agents because they are not registered businesses. Mercy Corps is working to train them in business skills and help them register their businesses. We are optimistic that Saint Marc can successfully transition to be a true T-Cash town. But we recommend the following: that Mercy Corps and T-Cash keep a critical eye on their joint operation to ensure that there is no conflict of interest; that they work closely with customers, merchants and agents in Saint Marc to ensure the development of a publicly available service rather than a closed aid program; and that they encourage link-up between different agents around the country. We also encourage TchoTcho Mobile to establish a strong presence in Saint Marc, in order to ensure that mobile banking in Haiti is competitive and prices stay low. Resolving the chicken-and-egg problem is not just about achieving a balance between users and agents; it is also about ensuring that different chickens are laying the eggs, and that the eggs can be transferred from one basket to another. --Photo #1: Women waiting to buy Mercy Corps food using T-Cash. Photo by Erin B. Taylor. --Photo #2: Merchants filling out paperwork for food aid purchases. Photo by Erin B. Taylor. 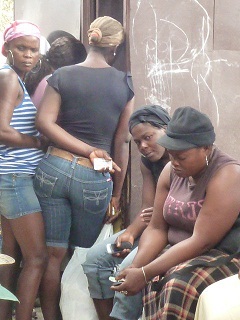 --Photo #3:Food aid beneficiaries waiting in line at a merchant, phones in hand. Photo by Erin B. Taylor. 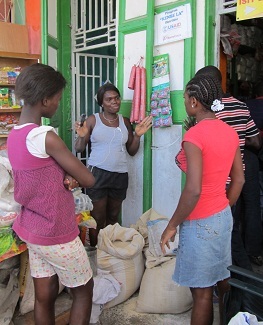 --Photo #4: Small Mercy Corps affiliated merchant in Saint Marc. Photo by Erin B. Taylor.